35 rue Hélène Brion, 75205 Paris Cedex 13, France. Formerly (2010-2018): MTi, INSERM UMR-S 973, Université Paris 7. Formerly (1987-2006): ITODYS, CNRS UMR 7086, Université Paris 7. The skewness m3 of an univariate distribution is the centered third-order moment normalized to the cube of the standard deviation. The square of the skewness, M3, was introduced by Pearson in 1895 (see ref. , p. 351) to measure the degree of asymmetry of a distribution. The squared skewness has an upper bound: M3 ≤ m4 - 1, where m4 is the kurtosis of the distribution, i.e. the centered fourth-order moment normalized to the square of the variance. This inequality is a consequence of a more general one standing for multivariate distributions (see eq. 6 in ). Many asymmetry coefficients were proposed in the statistical literature (see section 4.2 in  for an historical survey). The centered third-order moment and its multivariate analogs vanish for a symmetric distribution, although there are non-symmetric distributions with a null third-order moment. It should be noted here that the term "symmetry" denotes in this context an indirect symmetry (chirality) rather a direct symmetry (this latter is undefined in the univariate case). Despite its major drawback, the third-order moment has been widely used, probably due to its simplicity and to the fact that most known asymmetry coefficients offer the same drawback. The chiral index is an asymmetry coefficient which is null IF and ONLY IF the distribution is symmetric (i.e. achiral). The mean m and the variance s2 are assumed to exist. CHI takes values in [0;1/2] because Rmin cannot be positive. As a consequence of the convergence theorem in , the chiral index of a sample of n observations of a random vector in Rd converges to the chiral index of its parent distribution. CHI is thus easily computable with a pocket calculator: (a) sort the set with increasing values and then with decreasing values, (b) compute the correlation coefficients between the sorted sets, (c) add 1 and then divide by 2. Note that the correlation coefficient cannot be positive. The chiral index is defined for multivariate distributions. It is derived from a probability metric and has formal relations with the Monge-Kantorovitch transportation problem: see The Mathematical Theory of Chirality. The upper bound of the chiral index is 1/2 for monovariate distributions. This bound is asymptotically reached for the Bernouilli distribution when its parameter tends to 0 or to 1 . When d=2, the upper bound of the chiral index is shown  to lie in the interval [1-1/π;1-1/2π]. The bound 1-1/π is conjectured to be optimal and it is asymptotically reached for a rather awkward family of bivariate distributions . The most chiral triangle, i.e. the most chiral three points set, is known : see Fig. 1. For d=3, the most chiral tetrahedron, i.e. the most chiral four points set, is unknown. 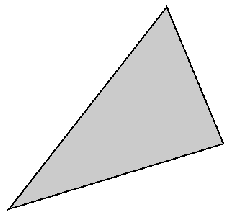 However the most chiral disphenoid (or isosceles tetrahedron, or equifacial tetrahedron), is known . Its chiral index and its triangular face are given in Fig. 2. For any d value, the upper bound of the chiral index is shown  to lie in the interval [1/2;1]. The upper bound of the chiral index of a d-variate distribution remains unknown when d>1. Contributions to the Mathematical Theory of Evolution,-II. Skew Variation in Homogeneous Material. Phil. Trans. Roy. Soc. London (A.) 1895,186,343-414. The Chiral Index: Applications to Multivariate Distributions and to 3D molecular graphs. Dolenjske Toplice, Slovenia, 25-27 September 2013. L. Zadnik Stirn, J. Zerovnik, J. Povh, S. Drobne, A. Lisec, Eds. Slovenian Society Informatika (SDI), Section for Operations Research (SOR), Ljubljana, 2013. Download PDF file of the lecture. Chirality and Symmetry Measures: A Transdisciplinary Review. Entropy 2003,5,271-312 (Open Access paper). About the Optimal Density Associated to the Chiral Index of a Sample from a Bivariate Distribution. Compt. Rend. Acad. Sci. Paris, série I, 2005,340,599-604. About Second Kind Continuous Chirality Measures. 1. Planar Sets. MATCH Commun. Math. Comput. Chem. 2015,73,375-384. About the Upper Bound of the Chiral Index of Multivariate Distributions.